Guess what I did today! 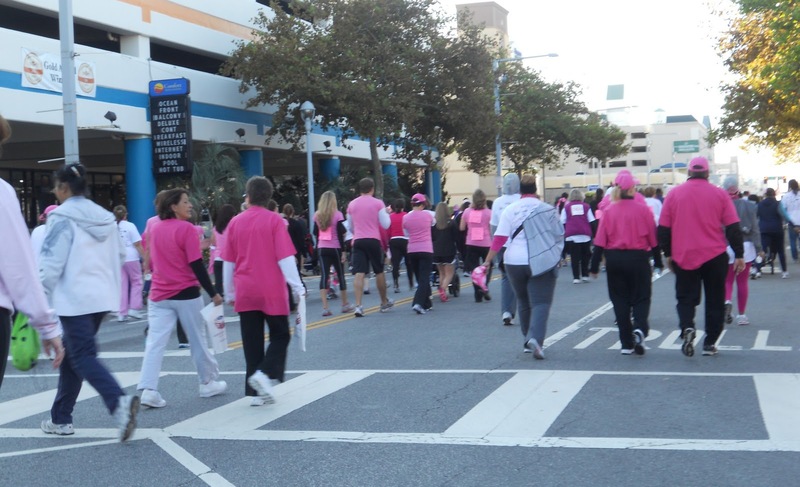 I participated in the breast cancer 'Race for the Cure'. I went with my mom and some people from the place where she works. She is a mammographer at Sentara. One of her friends brought her baby, who is extremely cute and well-behaved. He is just a happy baby. It was so cool seeing all of the people dressed up in pink. There were guys wearing bras and people (women and men) with pink tutus. I was surprised at all of the people wearing fun crazy outfits.There were SO many people! They kind of fanned out once the race started because some wanted to win and some (like me) just wanted to have fun. This was one of the many pictures I took just of people. 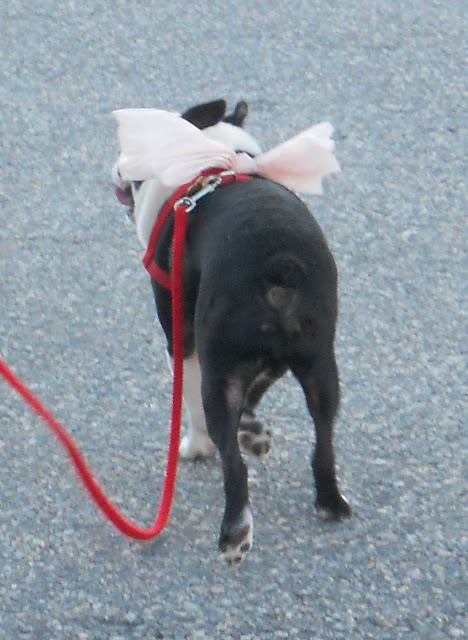 I don't know the owner of this dog, but I thought it was adorable with it's little pink bow. I thinnk it ight've been a boston terrier. This wig was free. 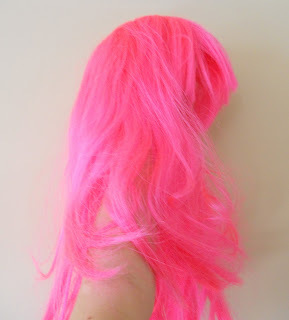 It is a bright pink bob wig that I got from a tent after the race. I was searching for cotton candy but, sadly, found none. I also got a free scarf, free water, and a free banana. I had a really great time. If you haven't done this, and there is going to be a race near you soon, you should do it. It was 5K, so not too far. Although, it didn't help that yesterday I also did a lot of walking. I walked on the beach for about 20 minutes, then went on a trail in the woods for ?﻿ number of minutes. Still, I was glad I did this. I would post more picures, but I don't want this post to become so long you don't want to read the whole thing, if I post more I won't be able to stop.